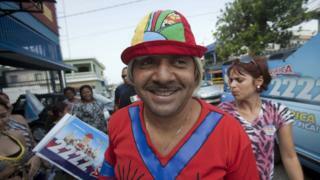 Tiririca said he was "ashamed" of his colleagues' behaviour and would return to being a full-time clown. In his first speech since he was elected in 2010, Tiririca, whose stage name means Grumpy, said he was saddened by what he had seen in the lower house of congress. "Everyone knows that we're paid well to work, but not everyone does work. There are 513 deputies, only eight come regularly. And I'm one of those eight, and I'm a circus clown." In his eight-minute speech, he admitted that he had "not done much" during his almost seven years as a lawmaker, but he said: "At least I was here." Tiririca has been very popular with voters. Campaigning under the slogan "It can't get any worse", he won 1.3 million votes in 2010, more than any other candidate in that election. Image caption Tiririca's campaign slogan was "Vote Tiririca, it can't get worse!" His win was not without controversy, with newspapers claiming he could not read or write, a legal requirement for holding office. But after a court ruled that he met the basic literacy requirements, he took up his seat and was re-elected in 2014 with the most votes in Sao Paulo state. Tiririca is not the only Brazilian with a negative view of lawmakers. Trust in Brazilian politicians has plummeted at a time when the leaders of both the Chamber of Deputies and the Senate are under investigation for alleged corruption, as are dozens of senators and deputies. A Datafolha opinion poll published on Wednesday [in Portuguese] suggested that 60% of Brazilians described the work of members of Congress as "bad" or "very bad".